Puck has always groomed himself more than the other cats but recently we noticed he had licked much of the fur of his belly, the inside of his legs and his back, near his tail. It was time for him to visit the vet but we didn’t have a vet for him. We had a vet for Tigger, near our old house, but his solution to Tigger’s recurrent mouth infections was steroids or antibiotics whenever the problem flared up. That probably helped send him to an early grave. I wanted a vet that would take a more holistic approach but the only holistic vet I could find in the area has no office and only does house calls, which is a bit over my budget now. I ended up choosing the vet that is just down the street from our house. I figured it was a crap shoot so I might as well pick close. I work four days a week and get one day off. That day is flexible and usually based on how busy we are, but my needs are factored in as well. I happened to have an appointment at the dermatologist for a check up that morning so it was decided that would be a good day to take off. 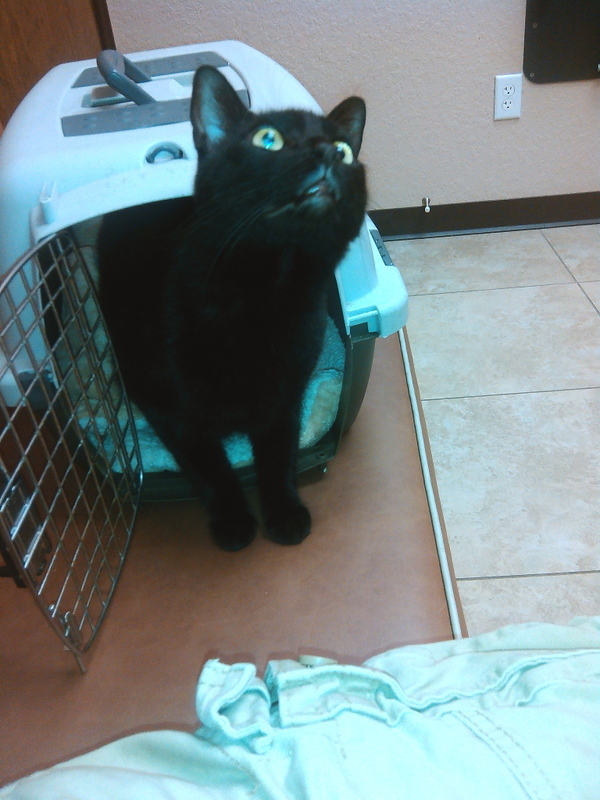 I called the vet and made an appointment for 11:00 a.m., two and a half hours after my doctor’s appointment. When I got home I took a carrier out of the shed and placed it on the floor on the patio. I didn’t want to wait until the last minute and risk Puck retreating under the bed from the sight of it. I had nothing to worry about. All three cats were drawn to it like a magnet. Frankie was the first inside and Chris and Puck did not like that. Is there room for two, Frankie? I’m just gonna rub my scent all over this thing until you come out. Eventually, Frankie came out and Chris went in. Ok, I’m in. Now what? 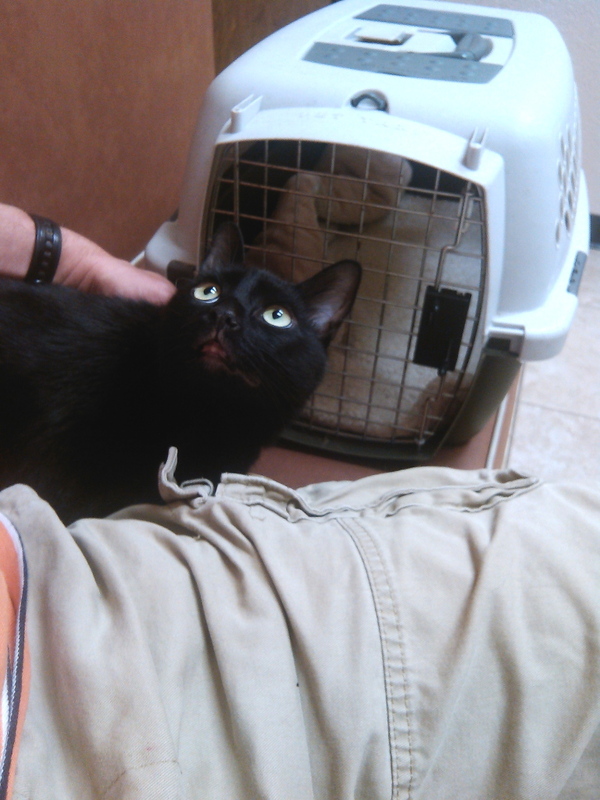 When the time arrived, I put Puck in the carrier, placed him in the front seat of the truck and drove the whopping two minutes to the vet’s office. We sat in the waiting room for about a minute and then were ushered into the examination room where we waited for about ten minutes or more for someone to come in. That happens to me often at doctor’s appointments (as it did that same morning) and I don’t much care for ir. I would prefer to wait in the waiting room where there is a television, magazines and other people. The exam room has nothing to look at except posters showing the inside of one part of the body or another. 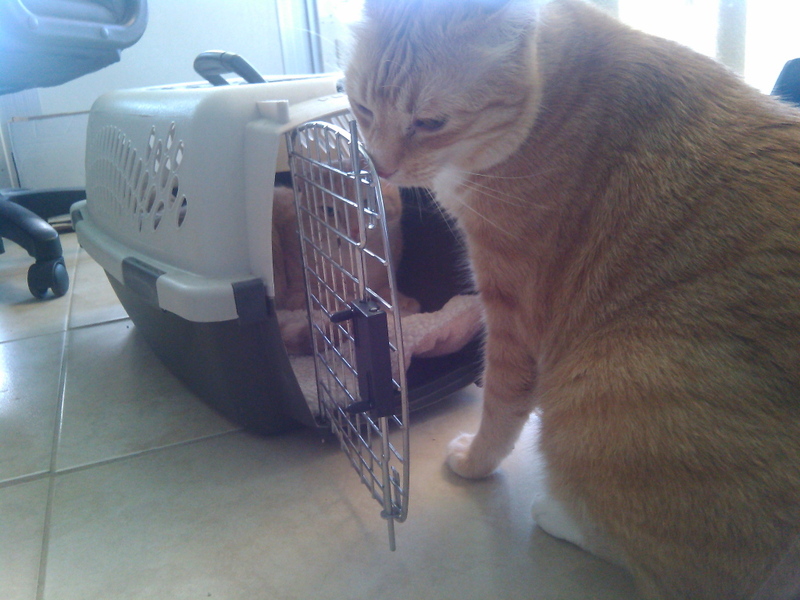 This particular time I did not mind waiting in that room because I was able to let Puck out of his carrier. Are those dogs I hear? I think I will hang out back here. Chris would have explored the room but Puck was content to stay close. 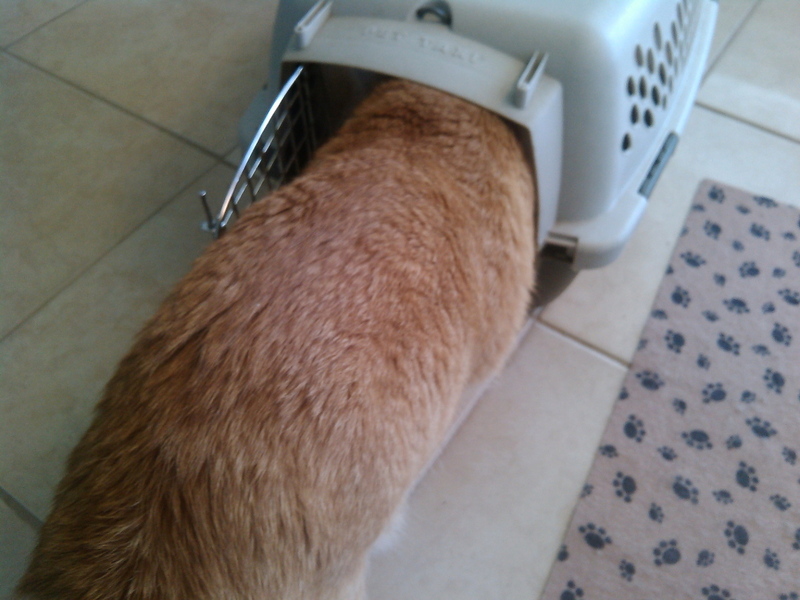 He even wanted to go back in his carrier at one point because of the barking dogs he could hear but I closed it. 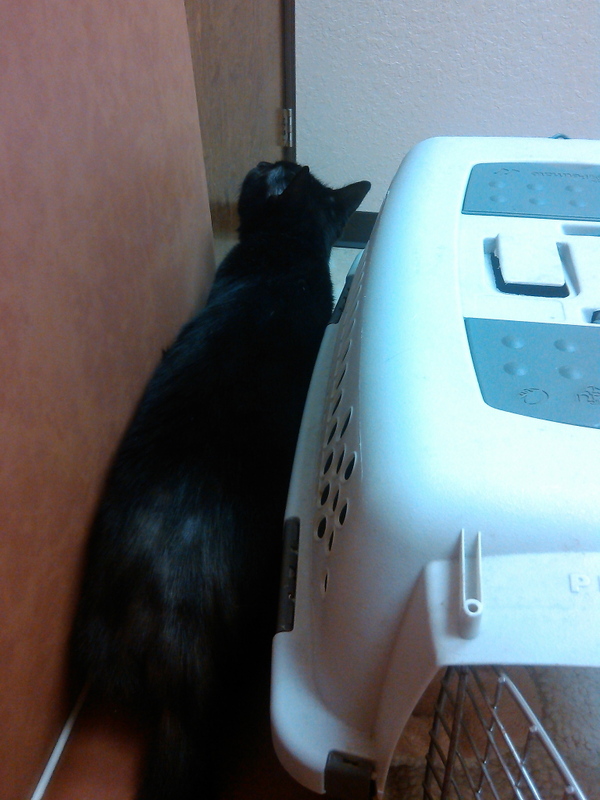 I didn’t want to have to get him out of there when the vet came in. When the technician came in, I tried to hand her Puck but that didn’t go so well. He climbed over my shoulders to get behind me and scratched me pretty good in the process. I was able to hand him to her on the second try. She weighed him and possibly a couple of other things that I don’t remember and then left. We then sat and waited for the vet. I think Puck was ready to go at that point. 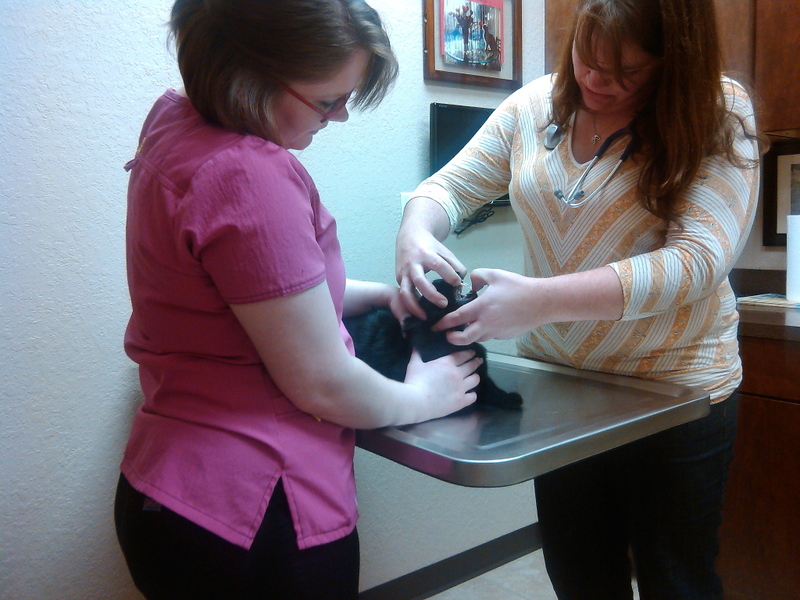 After a couple of minutes the vet came in to examine Puck. She suspected that he could be having an allergic reaction to flea bites, even though she could find no trace of fleas on him. When I told her the problem started not long after we moved, she said that fleas can lay dormant in a house and then become active when they have a host. I told her my other cats show no signs of fleas but that didn’t seem to matter. She told me a food allergy would present itself more in the face and a psychological grooming problem would not include the bumps or swelling. She also said that because he was missing fur on his back, near his tail (in addition to his belly and insides of his legs) , that was another indication of fleas. She then recommended a flea treatment for Puck and our other cats along with a shot that was both a steroid and antibiotic. Where have I heard that before? I’ll be honest. I don’t like the flea treatments. I think it is like every other drug; it helps with one problem while causing others. The same is true for steroids and antibiotics, but I also believe that some drugs can be beneficial in the short term and the vet wasn’t suggesting more than one dose of any of it, so I agreed but I didn’t get flea treatments for the other cats because I am not convinced it is a problem. Cats can get a condition called miliary dermatitis, which is the descriptive term used for a cutaneous reaction pattern of focal (localized) or generalized small papules (bumps) or crusts. Miliary dermatitis is not a specific disease. It is secondary to many other diseases. Causes of miliary dermatitis include insect (flea, mosquito, ear mite, etc.) bite hypersensitivity, atopy (sensitivity to aero-allergens such as pollen, mold, house dust mites, etc. ), adverse reaction to a food, bacterial superficial folliculitis (inflamed skin follicles), dermatophytosis (fungal disease), feline scabies, mast cell tumors, and pemphigus foliaceus. Flea hypersensitivity is the most common cause of miliary dermatitis. Upon returning home, Chris made sure Puck got plenty of attention. I’m so glad you’re home. Where have you been? It seems like the treatment has helped a little. Puck is still grooming a lot but not quite as much as before. On the down side, Puck is now sneezing quite often. I think he caught something at the vet’s office. This entry was posted in Uncategorized and tagged cat, excessive grooming, fleas, miliary dermatitis, vet on August 23, 2015 by Charles Huss. 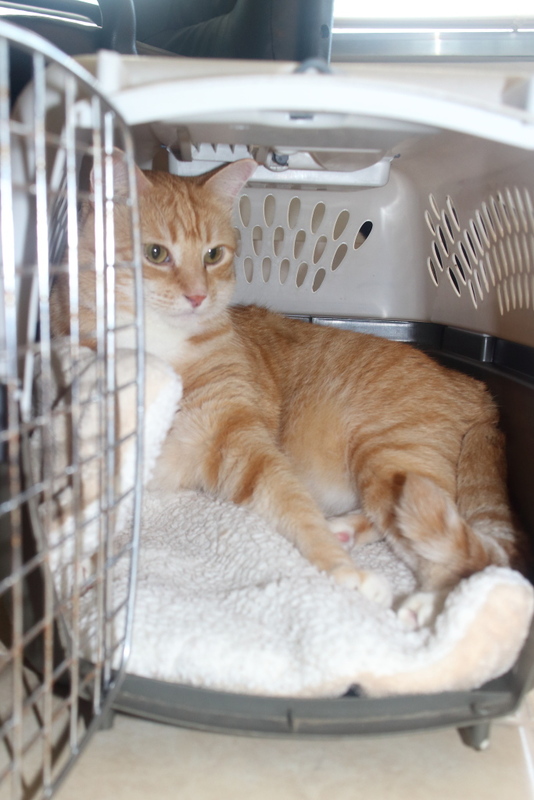 Cody gets allergy flare ups a few times a year which our vet feels is seasonal. I don’t love steroids either but cats tolerate Prednisonol well and that is what Cody is given during his flare-ups. 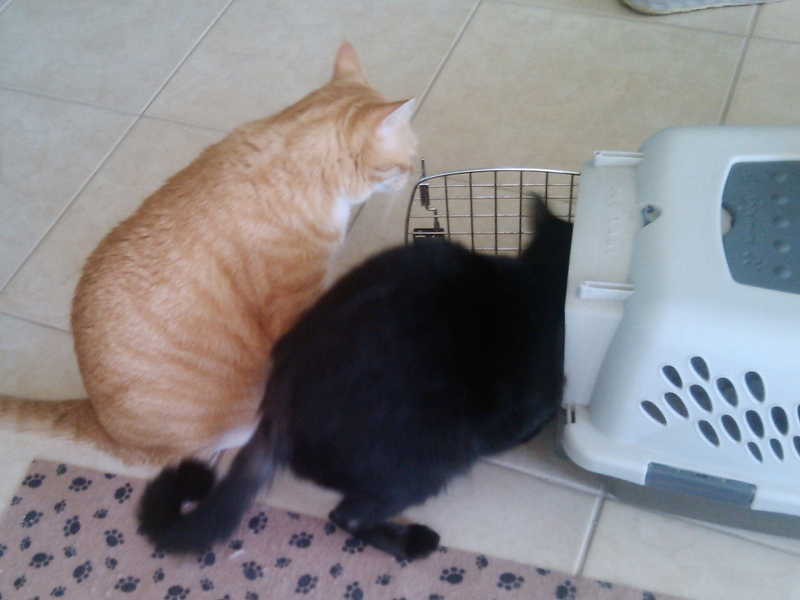 Love that your kitties go into their carrier on their own! Cody will go in (when it isn’t time for the vet lol), I bought one that opens from the top (no, not a Sleepy Pod, I don’t care for those)…..you just open the top (it is like yours but has an opening on top along with the door in the front) and plop the kitty in! That is a great idea for cats that don’t like the carrier. Thank you. 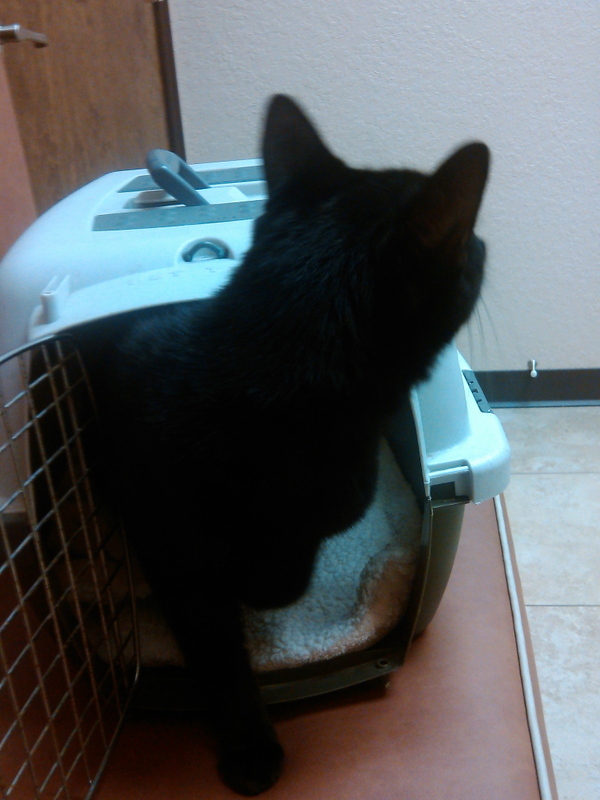 He let the vet and the technician do all kinds of things to him without putting up a struggle. Poor Puck! I used to scratch a lot too – the vet told my human I was purrobably allergic to flea bites – but the human bought me A Seresto flea collar and it is PAWSOME! I will look into that. Thank you. Also, they still work even if the collar gets wet! Sometimes it is hard to know which is the lesser of two evils. 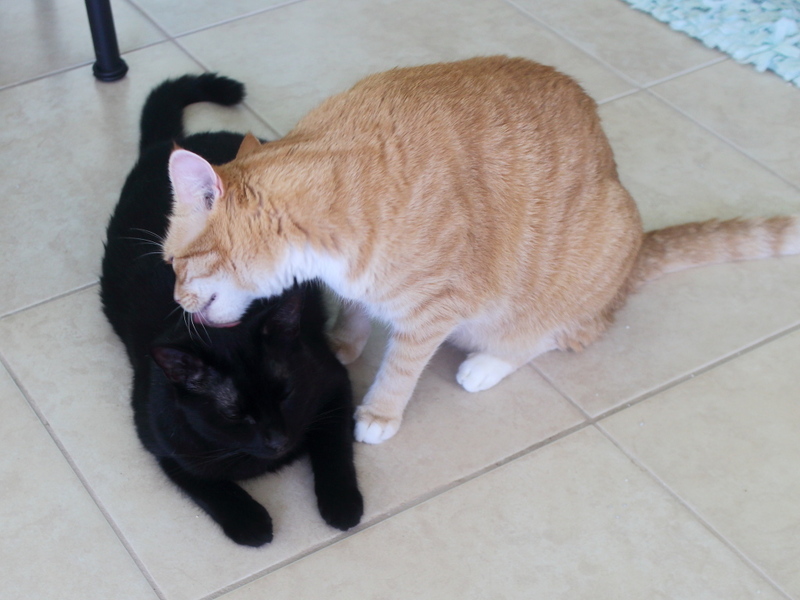 It is always hard to figure out why cats are excessively grooming (or pooping in the wrong places). Sometimes something simple, like a flea bite, right after you move, and the stress of the move can set off a whole passel of problems that can’t be traced back. We are purraying that it works! Thank you. You are right. One little problem can set off a series of other problems. I don’t like that she was so convinced it was fleas. I really think if it were fleas, you would have known by getting bitten yourself. I think I told you before, but just in case I didn’t- our Prancie has a similar issue and we use children’s Benadryl when she has flare ups. You would need to get the dosage from a vet though depending on weight. Hmm… that’s interesting. It sure would be a lot cheaper than a vet visit. I hope Puck feels lots better soon! My human agrees – too often, vets throw a one-size-fits-all remedy at a problem when they don’t know what else to do. Vets are no different than doctors. They just look for a drug that fits the symptoms. I sure hope Puck can get some relief – that constant itching/grooming thing has to be super bothersome for him………vets sometimes do leap to the “easiest” answer but often they are right on target. If he’s getting a bit better it may be an early sign he’s on the mend – we sure hope so! Thanks. Since I still see him grooming, the best way to know is to wait and see if his hair grows back.